The best teams are breaking away and there are a few unique players worth considering to make up some ground. I’m never one to chase a unique for the sake of it, but if they are killing it, low ownership certainly adds some incentive. is on fire! The big fella is back playing predominantly midfield and the results speak for themselves with career best numbers and consistent high scoring in the uber premium category. The superstar Dog is averaging 120 and has a break even of 79 while being owned by just three percent of the competition. Don’t hesitate to jump on and hitch a ride up the ranks. is at just nine percent ownership but that is sure to be on the rise throughout the week given his level of play is over the past couple of weeks. He is in sensational form for the Lions with scores of 146 and 135 in his last two, not to mention an easy matchup with the Bombers this week. He has a break even of 80 and is paying $1.20 to force his way into the rolling 22 for next week. Comes at a huge cost, but the cost of not having him is causing 67% of the competition some serious ranking headaches. It has got to the point that if you are within range to pounce on Whitfield, who for some reason has not been tagged this season, you do it. He is averaging 135 and carrying a break even of just 69 heading into what will probably be one of his tougher match ups from an uncontested mark perspective at Geelong. Having said that, he is the best in the business at finding space for a +3 and would be an outstanding addition to any side. 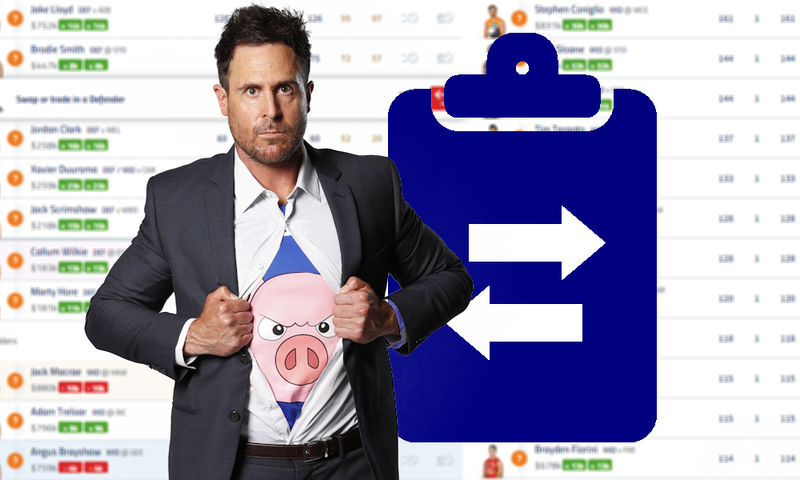 is the must have downgrade option this week for the injury and suspension riddled Tigers. He had a team high 10 intercept possessions on debut while collecting 17 possessions for an impressive 89 points. We can’t expect scoring like that every week but I would back him on the ground over Bailey Scott for those rolling with three midfield rooks. Looked right at home in his second game for the Demons, applying plenty of pressure and an avenue to goal. He scored 67 points and has a break even of -2 as a result which projects him to rise by over $31K this week. With cash cows hard to find on the bench this year, Jay is certainly a prime target this week. If you are one of the 16% of coaches who were stubborn and held Dusty, his two week suspension saves your season by giving you an excuse to say goodbye. He is averaging just 69 for the season but remains a nice price to upgrade to a form premium or even downgrade to Tom Liberatore (MID, $514,000) who is averaging 104 and carries a BE of just 14. At this stage I am getting in Stack and Lockhart for two failed rookies in the hope of some cash generation. Current owner of the throw away spot. Throw a blanket over the contenders here. Looks to have overcome his ankle complaint and had a far better balance between forward and mis roles. Hey, Roy! How’s Rocky? Has he rung you? So Matt Crouch plays for Collingwood now? Roy must be distracted with all those media commitments. Why else would he state, for the most part, the bleeding obvious? Lockhart on field over Stack and Scott? Who to field out of butters and stack? If Ross makes his debut for the Tigers this week is it a good idea to Trade both Gibbons and Scott out who are sitting on my bench and bring in both Stack and Ross? I agree with this. Would love to get Bont or Neale this week but feel that the above is better for cash generation for next week. Cogs & M.Crouch get another go this week. I also have Taranto – he has been great however he could get the chop to Bont or Neale. I am thinking Taranto to Libba as then I can upgrade Lycett to Grundy next week. Already have Gawn. Cogs I believe will be top 8 mid. Leaves me with 236k in bank then next week I can bring in either Witfield or Boak. Thinking of going Gibbons to Stack and Clark to Rozee, which leaves $5k for next week. Thoughts on trades or other options? I will have to look at moving on Balta soon as he isn’t generating any cash. Or I take a flier on Lambert filling the Cotch/Martin hole, but he’s incosistency is enraging, same with Billings lack of desire to lay a tackle..
What do you think of Lockhart’s job security? Considering if Justin McInerney debuting for Swans might be a better option? I want to trade out Laird and Clark to get to Whitfield. I’ve bought in Lockhart as a DEF/MID so I can bring Duursma into my starting side for Clark. Thoughts? You just have to keep Rocky- no sense in trading him now. There is always the chance he could go big against the tigers. Would you trade out Rocky to get in someone like Heeney or Boak? Only saying this because atm I have 7 deep mids plus Walsh meaning Constable on bench. Rather upgrade up front to get Parker off field so I can get Constable on the field. Thoughts? First trade is Scott to stack. Gaff, cogs, bont, cripps or trealor ? Gaff, trealor, bont, cripps, Sloane or cogs. Trade Toranto to macrea or sheed to cripps/Sloane?